Grab a ‘Fortnite’ Mobile Invite Code on Our Discord Server by…Catching Pokemon? If you’ve been on the TouchArcade Discord recently, you’ll undoubtedly be acutely aware of what Fortnite (Free) is, as what seems like everyone who owns an iPhone has been desperately looking for invite codes to try out the title early. We’ve had a steady stream of codes appear on our server, and while we’ve dispensed of the hundreds that Epic directly provided us, many kindhearted members of our community have been paying it forward with their spare invites, which is particularly heartwarming to see. However, despite this Fortnite excitement, a slightly more classic fad has started to fight back. 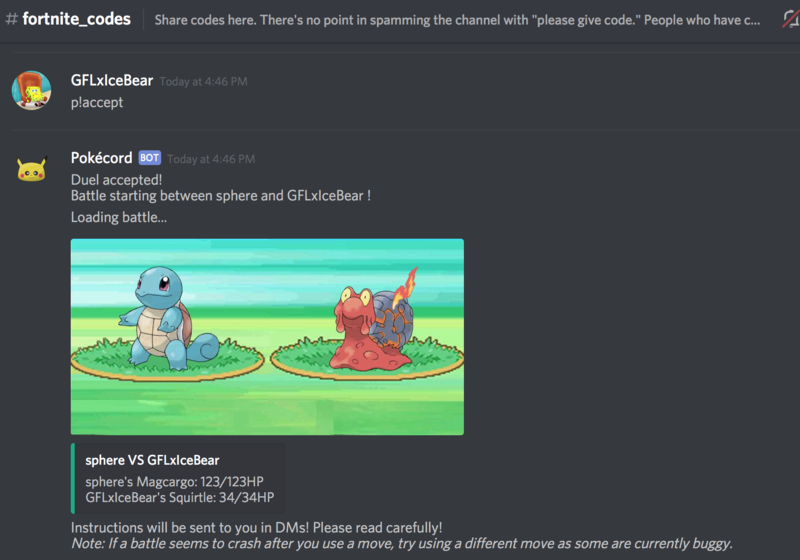 You may have written off Pokemon GO (Free), but the Pokecord Discord bot has provided surprisingly authentic and perilously addictive Pokemon catching action on our server, and is a great way to kill time while looking out for codes. And to celebrate this fantastic new bot, I’m going to give away my Fortnite invite codes to the three best Pokecord trainers this week. Niantic’s augmented reality time-sink aside, Pokecord is probably the closest to actual Pokemon you’ll get on your phone until Nintendo decide to print free money with a future mobile release. Pokemon randomly appear on the server, and the first person to identify the creature ‘catches’ it and adds it to their collection. Frequent posting levels up your Pokemon, and eventually you can challenge other Discord-goers to duels with your most powerful creatures. For a Discord bot, it’s surprisingly involved, to the point where ‘please can I have a code’ has quickly been engulfed by enthusiastic (and occasionally exasperated) Pokemon discussion. Of course, everyone is still there eagerly looking for a Fortnite code, but it feels like a community is emerging out of this continued engagement, which is nice to witness. If you’re still looking for a Fortnite invite code, or just want to play some Pokemon on our Discord server, use this link to join in the action. Who knows, I may actually let some of you catch a few Pokemon along the way.